Mt. Washington is the biggest climb in the NE. The mostly paved auto road rises 4727 feet in 7.6 miles, nearly a 12% average grade. There is a 22% grade section at the top! This climb is truly monotonically rising, no flat or downhill sections to catch your breath on the way up. There are a couple of extended sections of well groomed gravel that have not been a problem for my 23mm tires at all. Only twice a year (four times including practice rides) are bikes allowed on the private auto road for the Newton's Revenge race in July and the Mt Washington Bicycle Hillclimb in August. Riders must take auto transportation down. Weather at top can be downright nasty, even mid-summer. One year when I did the climb in August it was in the 60’s at the base, but 39 and extremely windy at the top, and it snowed that night! There have been times when the race was cancelled. For extra vertical, the most that can be achieved east of the Mississippi in this distance, begin the Mt Washington climb in the town of Gorham. 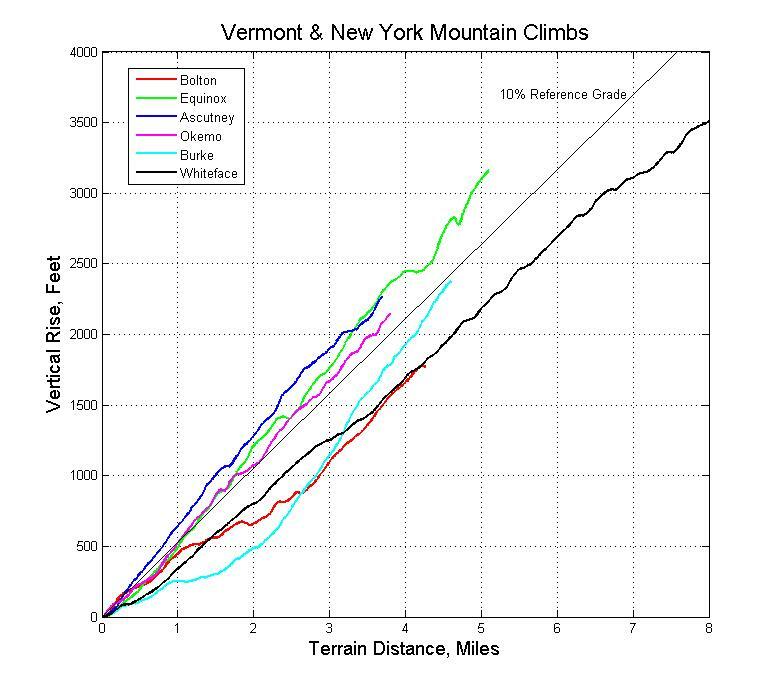 This adds almost another 800 feet of vertical, making for a near monotonic 5490 foot gain. That’s more than a mile straight up! I did this for the practice ride in July ’03, and the gradual grade leading up to the steep autoroad was a perfect warm-up. The nearest contender, Mt Mitchell in North Carolina, may reach a few hundred feet more in altitude, but the base elevations in a large radius around Mitchell are so high that a larger elevation gain cannot be achieved. Clingman’s Dome on the TN/NC border also comes close, but the elevation gain is spread over many miles. Mt. Kearsarge is located in central NH, just off I-89. I park in the car pool lot right off Exit 9. Ride towards Warner center, follow signs to Rollins State Park. Stay on main road to toll gate. You will ride 6.0 miles, gaining several hundred feet, before hitting the toll booth. Depending on time of day/who is there, you will probably have to pay a $4 day use fee since the auto road is in a state park. The climb gets down to serious business once you pass the toll booth. The grade nearly matches that of Washington for the next mile before easing a little. The road has been resurfaced in June 2008. The new pavement is narrower than the old, so great care must be exercised on the descent. There is barely enough room for a bicycle to pass a car coming up. I have ridden my MTB up a few times. This way I can also ride/carry the last 0.5 miles on the trail to the summit. The view at the very top is spectacular and worth the extra off-road riding/hiking. This climb begins in the town of Wilton, taking Route 101 to Miller State Park were you will find the very steep summit road. The haul up busy Rt 101 is gradual at first, then you notice the uphill slow vehicle lanes right about when your quads start to burn. The toll road to the summit offers only 800 feet of vertical, but it packs a very steep punch, steeper than Washington in fact. The last 2/10 of a mile are approximately 20% grade. This road is in a NH state park, so during summer daylight hours a use fee is generally collected. Once you pay though, you may ride your bike up and down as many times as you like. The ranger there has told me he’s seen individuals make many round trips to the top and back, training for Mt Washington. This descent has some very tight hairpin switchbacks and bumps, so caution is needed on the descent. Located in Acadia National Park, this mountain rises literally from sea level to 1500 feet. Needless to say, the views here are so good they make it into those fancy glossy calendars. This is a very touristy area, so expect a lot of cars, cyclists, and hikers on the summit road. 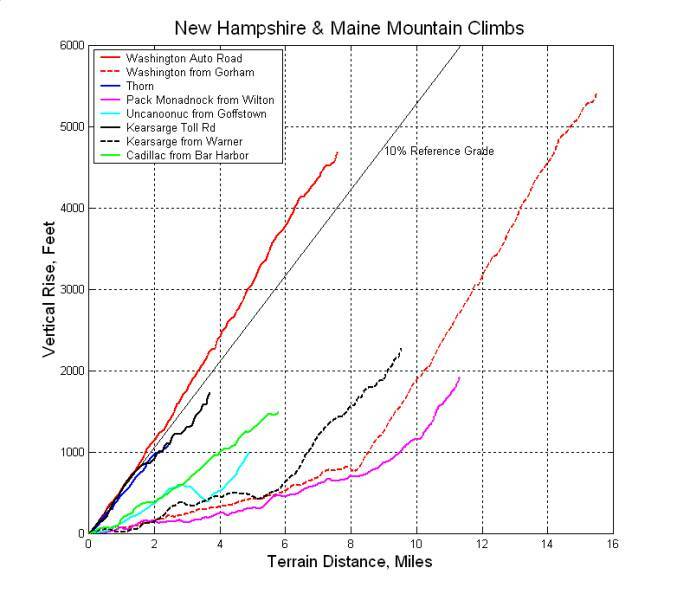 To realize 1500 feet of vertical, one needs to start near the ocean or from town (Bar Harbor). Profile shown is starting in Bar Harbor. This climb begins in Jackson from Rt 16B and climbs to the long ago abandoned Tyrol Ski Area. Thorn Mtn Rd (sign says "Switchback Road") is taken, which has some >12% grade sections. There are many tight, steep switchbacks on the lower portion of the climb. Near the top, at the saddle between Thorn and Middle mountains, a left is taken on Presidential Ridge Rd to the high point of Middle Mountain. You can catch a nice view in a few spots between the houses. There are a few bad spots in the blacktop to watch out for on the way down. The Uncanoonuc mountains are located just west of Manchester. You may have noticed S. Uncanoonuc while driving on I-93 looking west over the city, you know, that mountain with a massive antenna farm at the top? Climbing starts for this mountain several miles out from Summit Road. You can park in Goffstown. From Rt 114 in the center of Goffstown, start climbing on Mountain Road. This will go up in spurts, level off, then descend a couple hundred feet. At the “Y,” bear left on recently repaved Back Mountain Rd. Summit Rd is accessed from Back Mountain Rd in a short distance. The really steep stuff doesn’t hit you until part way up Summit Rd. I would guess parts of it exceed 15% grade. If you follow the gravel summit loop around, you can catch a nice glimpse of Manchester. Summit Rd has been reconstructed and is wonderful to climb and descend now. Could work well for interval repeats. My best time is 5:40 minutes. Several of the roads around the Uncanoonucs have been reconstructed in the last few years, so the riding here has vastly improved. Whiteface Mountain is located just outside of Lake Placid. This climb is the next closest thing to Mt. Washington. About the same distance, a little less vertical, so not quite as steep. Just means you go faster, not easier. View from the top is spectacular. Start the climb from the town of Wilmington at Routes 86 and 431. Climbing starts off with about 8-9% grade for first three miles. It flattens some around the toll booth area, then resumes at 9-10% average grade for the next three miles before tapering off again. Whiteface provides an exhilerating descent, but the road surface continues to deteriorate. The long straight-aways between turns draw you into adrenaline pumping speed. You must watch out for huge frost heaves though. You can no longer hit those at speed without consequences. Serious injuries have occured. With state budgets the way they are, it could be some time before the summit road is repaired. Also use extreme care when overtaking slower riders, who may unexpectedly swerve to dodge frost heaves. The lower three miles of the descent are straighter and a little less heaved. You'll develop fatigue from clenching the bar so tightly as your eyes tear up in the wind. For a long time, my highest speed record was on the lower portion of Whiteface. Do be careful though. I personally know two guys that have wrecked hard on descents. It is never a pretty sight. Bicycles are now allowed to ride the toll road during operating hours after paying a toll ($6 in 2013). You may want to see about paying your toll first if timing yourself on a training climb, else you'll have to stop at the tolls. See Toll Road for more info on toll road hours. Private toll road Skyline Drive climbs to the summit of Equinox Mountain. Bikes regained access to this mountain when the annual Gear Up for Lyme hillclimb race started in 2004, and this is the only time bikes are allowed on it. It is claimed to have a short section of 28% grade, but after racing this mountain, my hunch is I don’t encounter anything steeper than 15 or 16%. The summit offers spectacular views in multiple directions if it is not in the clouds. The road is very smoothly paved, tollbooth to summit. Unfortunately, like Mt Washington, cyclists are not allowed to ride their bikes back down. On the drive back down, pull off along the ridgeline to take in different vantage points of the view. Burke Mountain is located in the Northeast Kingdom area of Vermont. This climb starts from the village of East Burke on Rt 114. You can park at East Burke Sports or the MTB parking lot across the street. The first two miles of climbing are mellow. Then you hit the toll both and you start to feel the burn in your legs. Around the 2.5 mile mark, you hit a quarter mile of 20-25% grade! This really hurts and you think it’s never going to end. The toll road is only 2.7 miles of the 4.7 mile climb, but this 2.7 miles averages 13-15% grade. The entire route up has recently been repaved, so the descent is not as white-knuckle as some of the others. The potential for on-coming cars, very narrow road, steep grade, and tight switchbacks will keep you on your toes. You will need to reduce air pressure and/or let your rims cool on the way down. The annual hillclimb race here starts at the ski base area, just below where the toll road starts. Mt. Ascutney gets a “5” climbing rating due to its steepness. 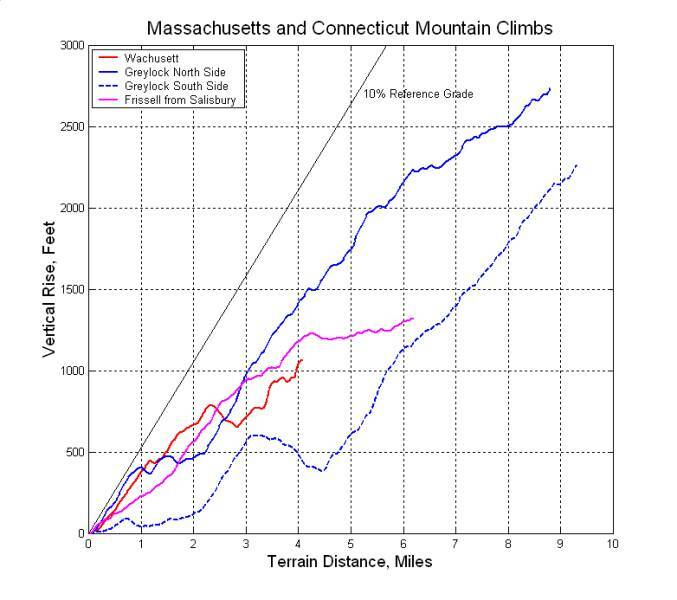 As you can see from the graph above, in the first 1.5 miles Ascutney gains significantly more vertical than any other climb. There are sustained 19% grade sections. I find Ascutney a more grueling climb than Washington. It’s only half the vertical so you push harder in the race knowing the pain will be over in 30 minutes. Ascutney has some very tight switchbacks and a few frost heaves, so it gets an intermediate descendability rating. You can ride Ascutney anytime for a small use fee, but check with the state park to make sure a special event isn't taking place. There are auto (!) races up this road, and a foot race I believe. I have ridden my mountain bike up Ascutney on a couple of occasions. There is some brutally rugged off-road riding around the summit of the mountain, which rises a couple hundred additional feet above the parking lot at the top. This is one of the best mountains to test your Mt. Washington race gearing on. Ascutney is also a popular hang-glider launch mountain. You are allowed to ride to the summit when the gate is locked, but be mindful on your descent that hang gliders can drive up any time. They have keys. Ludlow Mountain, aka Okemo Mountain, offers a respectable paved climb. The grade is virtually identical to Washington, and like Ascutney, rises only half Washington’s vertical. Like many non-essential roads in the northeast, old man winter has his way with them. On your climb, note that the pavement is broken up in many places, particularly in the descent lane. You must avoid this on the way down. Park in the business lot on Rt 100 to squeeze as much vertical out of the climb as possible. The highest part of the mountain is reached by continuing on the gravel road a couple tenths of a mile, but I do not recommend riding it unless you are on a mountain bike. It is quite loose with large sharp rocks. Consider bringing cleat covers for the short hike to the lookout tower though. The 360 degree view is worth it. Along with nearby Ascutney, this is a great mountain to test your gearing and ability for a Mt. Washington size climb. The bonus here over Ascutney is no toll is collected. Ascutney and Okemo can be linked in a 61 mile loop for the climbing enthusiast. Bolton is popular among cyclists from the Burlington and Montpelier areas. The climb goes up the Bolton Valley Ski Area access road. Begin at Rt 2, between Exits 10 and 11 of Rt 89. The climb ends at the base of the ski area, not the mountain summit. The first 2.5 miles of the climb are undulating with some short 10-12% grade sections and one slight downhill. Then you hit the double switchback and it stays very steep for the remainder of the climb. The descent is one of the best out there. Only one or two bumps near the top, then 50+ mph the rest of the way down. Be sure to watch your speed (and on-coming cars) through the double switchback however! There have been hillclimb time trials here in the past, but I’m not familiar with the start and finish lines. I timed myself from the stop sign at the bottom to the high point of the traffic circle up top. Wentworth Rd at the top on the right, which looks to be paved, can be taken to add a couple hundred additional feet of climb for a net 2000 ft climb. Located in the Berkshires of Massachusetts, Mt. Greylock offers a very respectable climb with spectacular views. I climb it starting off of Rt 8 in N. Adams on Furnace St, then hanging a quick left onto Reservoir Rd, which is perhaps the steepest part of the whole climb and you haven’t even left town yet. You can park right there at Heritage State Park. It starts out with several sustained, very steep sections, then moderates as you approach the summit. The completely reconstructed state park road has been re-opened May, 2009. 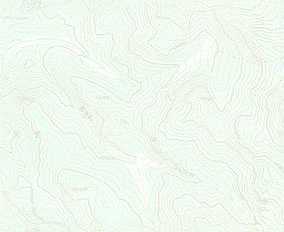 Look for buttery smooth surfaces to climb and descend on. I have never climbed from the south side, but I have gone down that way many times. When descending, please be careful of the rumble strips at hiker crosswalks. They can be quite harsh and will scare the wits out of you when not expecting them. Mt Greylock, due to the up-and-over nature of its summit road, can be readily linked into great loop rides. Located in the very NW corner of the state, this climb was claimed to be the highest paved road in Connecticut per the now defunct King of the Mountains website. Having ridden this climb in late 2012, I learned it is a rough, unpaved seasonal road. Most riders would not want to attempt it with a standard road bike. A cyclocross bike is more suitable. The climb begins from Rt 44 in Salisbury on Factory Rd. Coarse gravel Riga Mtn and Mt Washington roads complete the climb. The profiled route ends at the high point of Mt Washington Rd, which is in between Mt Frissell and Gridley Mtn very near the CT/MA border. Wachusett Mountain is the easiest mountain climb reviewed here. There are some sustained steep sections, but flat or even downhill sections allow recovery. This climb, taking the time-trial route, begins below the ski area base lodge on Mountain Road. Then hang a right into the state park summit road which wraps around to the top via the one-way auto road. The last little bit to the parking lot up top is quite steep actually, maybe 15%. On clear days you can see Boston from the summit.